Alessandro Scarlatti is generally considered one of the most important Italian composers of the late 17th and early 18th centuries. But his music, although it has received more attention in recent years, is still largely unknown. This is partly due to the large quantity of his output: in the genre of the chamber cantata alone at least six hundred compositions are with certainty attributable to him. Scarlatti's reputation started to wane in the early 18th century. His style was considered increasingly out of fashion. Since 1696 Scarlatti had been in contact with the court of the De Medicis in Florence, but his attempts to obtain a permanent post there failed, as Prince Ferdinando found his music too 'studied'. Scarlatti's style of composing was more connected to the past, with its use of counterpoint and the strong connection between text and music, than the growing preference for more light-hearted music after the turn of the century. Alessandro's rise to fame began with the performance of his pastoral opera 'Gli equivoci nel sembiante' in Rome in 1679. The work had a great success and spread across Europe in no time. It was followed by a large number of equally successful operas. As there was a strong connection between opera and chamber cantata it is no surprise that Alessandro turned into a master of this genre as well. The present disc underlines impressively how close opera and chamber cantata were. The title characterises the works recorded here as 'dramatic cantatas', and that is spot-on. All four are about single characters who are speaking, sometimes introduced by a kind of narrator, who explains what situation the protagonist is in. In the first cantata we meet "l'anglico eroe", the English hero, who very likely is King James II. He figures in many compositions of that time, which can be explained by his Catholic conviction, which made him a hero from the perspective of the Counter-Reformation. The cantata is about James preparing for reconquering his throne, leaving wife and son behind. He successfully suppresses his tears: "And before he had gained victory over his enemies, his soul already could claim a trophy, because she had not cried." The first recitative contains, as so often in Scarlatti's cantatas, arioso passages. The second recitative is full of contrast, both in the soprano and basso continuo parts. The blowing of the winds through the sails in the aria 'Sento l'aura che fedele' is illustrated by the strings. Strong ascending figures illustrate the hero saying "Al trono, al trono!" (to the throne!). The second cantata is called 'serenata' and is about love-sick Amaryllis unable to find sleep in the night. When sleep fails her she prefers to die: "Yes, being deprived of happiness, I will happily embrace death. If I cannot enjoy the reason for my grief while living, death is welcome to end all my misery". Elisabeth Scholl, in her programme notes, calls this cantata "almost romantic: its long melodic lines and its dense sensuous atmosphere are almost tangible." The first aria, 'Vieni, o notte' (Come, O night) is a good illustration of this. The aria 'Veloce e labile', where the protagonist complains that "hours stand still to hurt me" contains some strong dissonances. The third cantata is rather unusual: here it is the Roman emperor Nero who is speaking, demonstrating his extreme cruelty and his enjoyment of the slaughter he causes. It begins with Nero proclaiming his absolute power: "I am Nero, the commander of the world and the master of all souls down here." Even for Jupiter he has no fear: "I want that Jove trembles before the splendour of my countenance", nor for the underworld: "And also with the underworld and with Pluto I want to compete". The aria 'Veder chi pena' is set as a tarantella, a southern Italian folk dance. This could be interpreted as the ultimate demonstration of Nero's cruel character, as he sings: "To watch those that suffer and sigh is my heart's desire, villainous since birth". In the last cantata we meet Orpheus who has just lost his Euridice for a second time. He laments his fate and wants to die in the aria 'Chi m'invola la cara Euridice', containing strong dissonances. Later on he complains that his singing has lost its power to move. 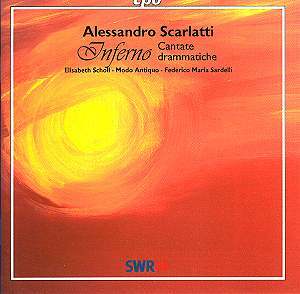 This disc is a very impressive demonstration of the art of Alessandro Scarlatti. In these splendid cantatas the composer demonstrates his ability to characterise the protagonists with musical means and to depict the text according to the rules of rhetoric and with masterful use of the 'affetti'. Elisabeth Scholl, who also edited these cantatas, wrote the programme notes and translated the lyrics into English, has done an excellent job in every department. Her singing is impressive, and she expresses the feelings of all protagonists with great care. I especially liked her performance of the recitatives, a weak point in many recordings of baroque vocal music. On past showing she has never struck me as a very dramatic singer, but here she proves me wrong. And the combination of Ms Scholl and Modo Antiquo turns out to be a very happy one. In earlier recordings Federico Maria Sardelli has demonstrated his feeling for theatre, and he does so here again. To sum up: this disc is one of the best I have heard this year. It goes straight into my list of recordings of the year. It is a model of the useful marriage of musicology and splendid music-making.